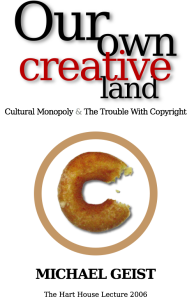 In my Hart House Lecture, Our Own Creative Land: Cultural Monopoly and The Trouble With Copyright, I discussed a number of topics, including the Bulte incident, the opportunities presented by the Internet, the context of the current round of copyright reform. I concluded by sketching out an alternative and forward-looking vision of Canadian copyright law. The audio is available as part of the Needs No Introduction series on Rabble.ca and a lecture book in PDF form is available for free download. A video broadcast of the lecture appeared on TVO’s Big Ideas program, but is no longer available online.